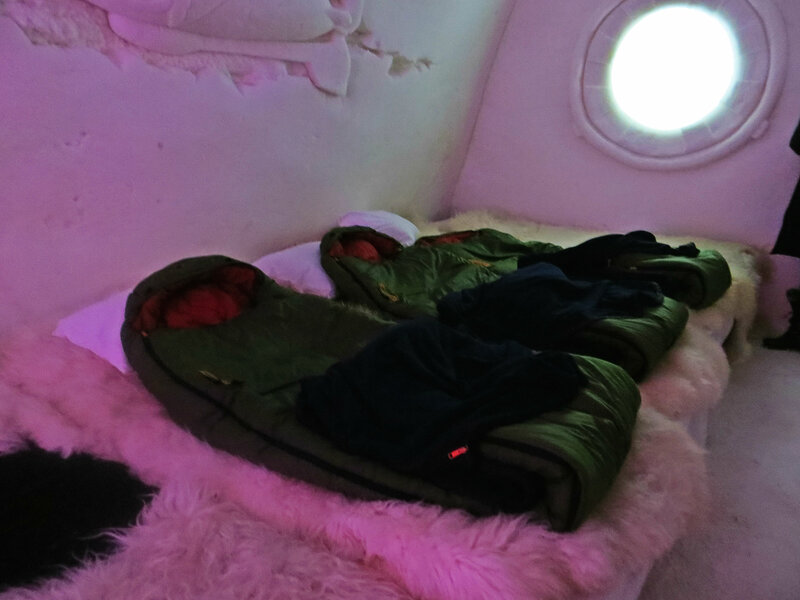 How to Survive a Night in an Ice Hotel! Posted on September 25, 2013 by Akashic Love & Light! The city of Kemi is located just south of the Arctic Circle in Northern Finland, because of its position near the Arctic Circle nights are longer than average during the winter months. In addition, temperatures plunge anywhere from 0 to 16 degrees in February. During the weeks leading up to my trip I was asked by friends and family if I was crazy. Finland is freezing! 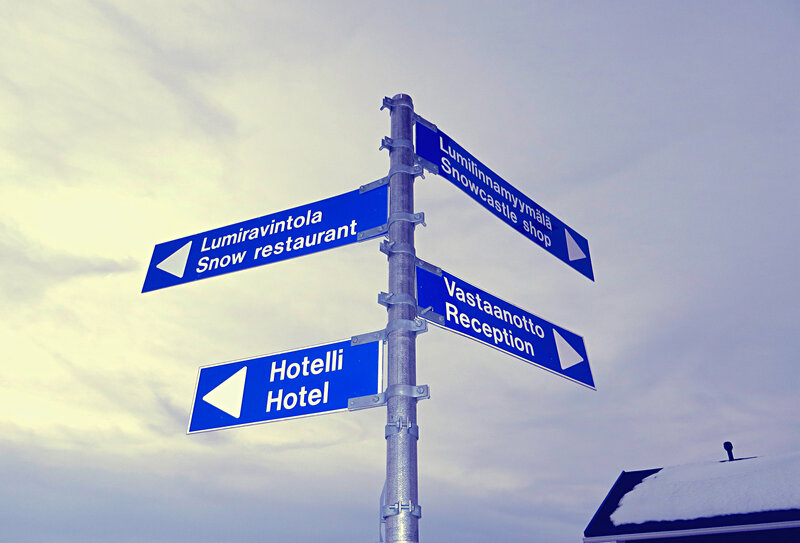 Yes it is but where else can you go to visit the LumiLinna SnowCastle, visit a reindeer farm, snowmobile on a frozen sea, and go Dogsledding? 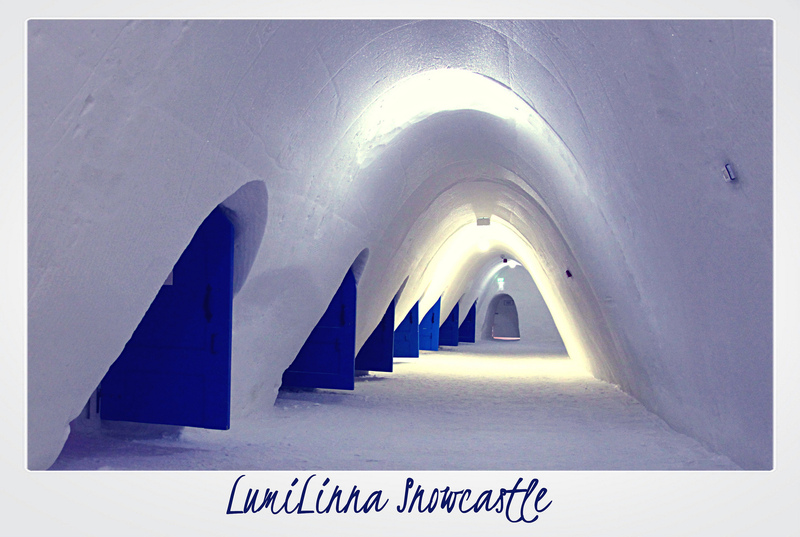 The Kemi LumiLinna SnowCastle in Finland is a real hotel and castle made entirely from ice and snow. 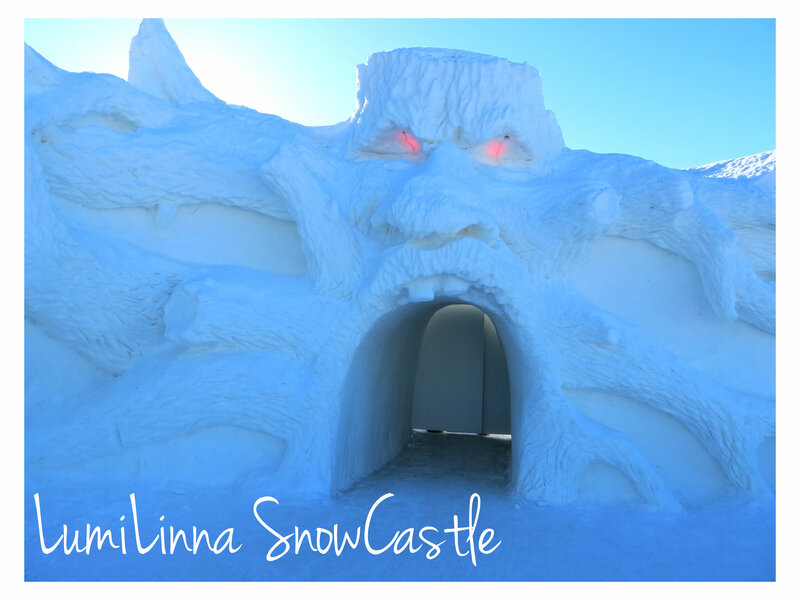 Each year weeks of preparation go into building the castle from the ground up using blocks of ice and snow made from the nearby Gulf of Bothnia. 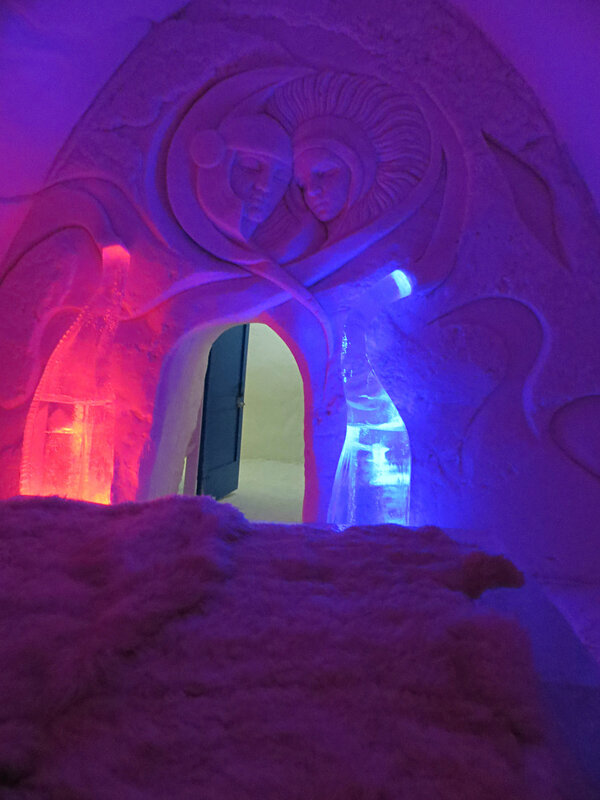 The Snow Castle grounds include a 21 room SnowHotel, a SnowRestaurant, a SnowChapel and an IceBar. The grounds of the castle sit on the icy coast of the Gulf of Bothnia. Construction of the SnowCastle begins yearly in December and continues for about a 6 week period culminating in its grand opening event that takes place in the end of January. For the 2012 SnowCastle, approximately 21000 m3 of snow was used in construction, which is roughly the amount of 2100 truck-loads. The SnowCastle area will be 5000 m2, which is the equivalent size of about one-and-a half football fields. Building the castle is a huge feat for the some 60 builders of this working hotel and restaurant. The walls and entire structure of the castle and the grounds are constructed with piped snow, blown into various types of molds with a high-powered snow blower. Once the snow has hardened the molds can be removed leaving a very sturdy structure made entirely of snow. All of the snow, ice and water come from the nearby Gulf of Bothnia. When the season is over at April’s end, the structure is completely demolished and pushed back by tractors into the Gulf, from where it came from. Each year the theme of the SnowCastle changes: some of the previous themes were Fire; 2007, the Sea; 2008, Travel, 2009 and on the 15th anniversary, the theme was National Romanticism. The Snowcastle’s theme for 2103 was Fantasy. Images of storybook tales were carefully engraved in the snowy walls and many rooms contained frozen characters sculpted entirely of ice. There was even an Angry Birds room. Spending the night in the castle is an unreal experience especially at nighttime when the lights are shining on the glistening ice ans snow. We checked in at the Snow Castle at around 5pm, this gave us plenty of time to explore the castle before our dinner, which was scheduled at 7:30 that night. The hotel has a heated lounge with lockers where guests can store their luggage, purses and cameras. Aside from the lockers, the rustic-looking lounge is a fully-equipped and quite cozy with couches, tables, TVs, a little snack shop and a souvenir shop. The bathrooms are located outside the lounge in a heated facility. After storing our stuff, we bundled up and excitedly ran out to check out the snow castle grounds. First stop was the SnowChapel, the room was dimly lit with green and white lighting casting a peaceful glow over the little chapel. People can actually get married here and then spend their honeymoon night in the honeymoon sweet equipped with a king size ice- bed. After we took some photos of us praying in the chapel and checking out the castle we were notified that our dinner was ready early. 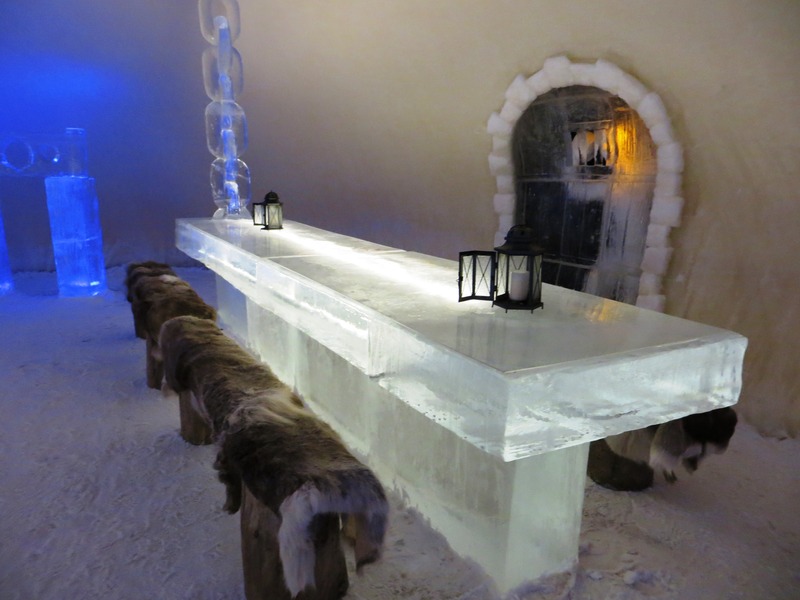 We headed over to the Snow Restaurant, there are two separate seating areas both filled with tables made entirely of slabs of ice. The chairs are tree stumps covered in reindeer fur. At this point we were hungry and getting a little cold so we sat down at our reserved table. The meal consisted of three-courses with a welcome drink served in a cup made from ice. The food is served in tin foil on wooden plates so that the heat doesn’t melt the tables. We all chose the hot Lingonberry juice to start to warm us up rather than the cold Finlandia vodka and cranberry drink in an ice cup. We each had different options that had to be ordered well in advance. I had the Castle´s Vegetarian Menu; which consisted of Cream of vegetable soup, a Vegetable bake made from broccoli, peppers and potatoes with a lemon sauce and for dessert a warm blueberry pie served with vanilla custard. My Friends had the Feast a’la Snowcastle; cold smoked salmon soup, fried fillet of chicken served with rice, onion and pepper with a smoked reindeer-cheese sauce. Then for dessert warm apple pie with vanilla custard. The food was delicious and hot but we actually ate quickly as the cold was starting to set in just sitting at the table. Luckily the service was good and the food came out fast! After dinner in the restaurant, there are a number of fun things to do to occupy your time. 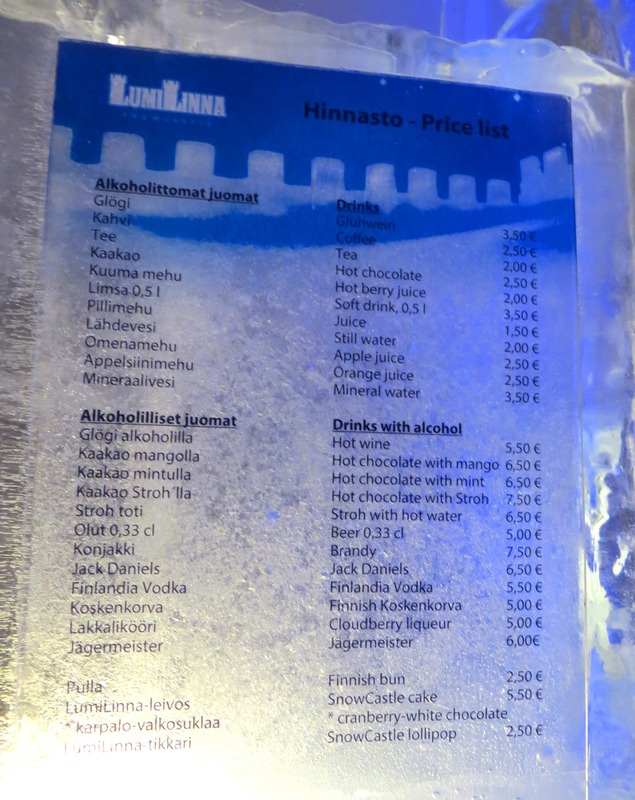 There is the Icebar where even the menus and cups are made from ice. Some of the drinks that are typical of Finland are Finlandia Vodka, or Cloudberry Liquor, but because it was so cold we opted for a Hot Chocolate. Even dressed in complete Arctic wear staying warm is an issue. The temperature in the castle is a steady 23 degrees regardless of the outside temperature. We could not sit in the bar area very long and drink. We kept busy taking photos of each other and the bar. Afterwards we headed over to the room with the Ice Slide and took turns making silly videos of us going down it. This served the dual purpose of having fun while keeping warm. After making a few silly videos we headed outside to slide down the sledding hill, by now it was dark outside. Sledding down the hill was fun but we decided to warm up in the lounge before turning in for the night. We found a comfy couch to sit on and we each got a hot chocolate spiked with Rum. The rum did actually help warm us up! 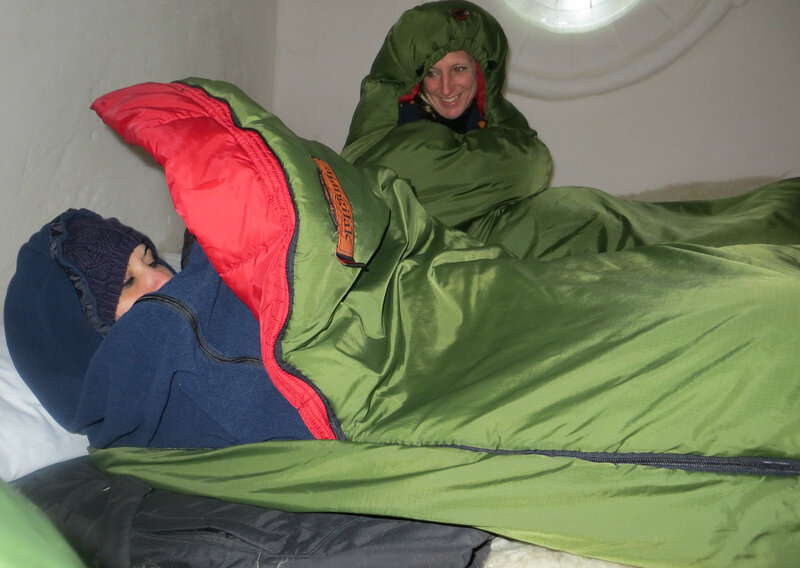 The cheerful hotel clerk informed us that a presentation on how to use the sleeping bags would be starting soon. Probably not a good idea to skip this informational piece! A couple of key pieces of information we made careful mental notes of; each bed in the castle is covered in animal fur that you sleep on top of. 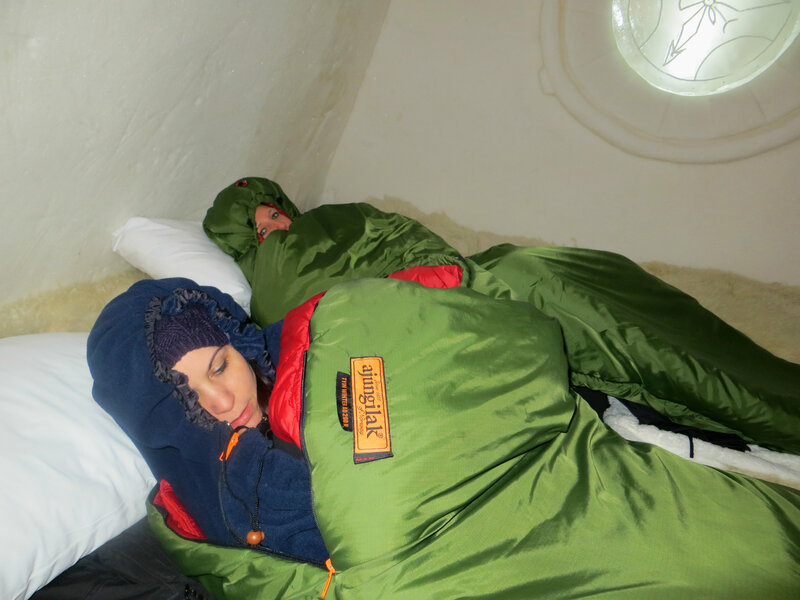 Each guest gets a survival grade sleeping bag with a warm insert both pieces need to be zipped up to keep the warmth in. First put the inner sleeping bag inside the heavier one. Unzip both of them partially so you can get in but easily zip it up when you are inside. After getting the bags organized-here is the fun part! You need to take off your outerwear and clothing; basically stripping down to your baselayers. According to the presenter this is absolutely necessary and the sleeping bags will not work as well if you leave your outerwear or too many layers on. Once you take everything off you need to put your clothing between the animal fur and the sleeping bag. The point of this is so your clothes do not freeze, or at least stay somewhat unfrozen for when you have to get dressed in the morning. The boots just stay out and there is no way of getting around sticking your feet into a frozen boot in the morning. The demonstration looked easy enough and off we were to bed, by now it was about 11pm and we were tired from our dogsledding excursion earlier in the day. One word of warning! Go to the bathroom before turning in for the night! The bathroom is outside in an adjacent heated building but it is still very cold getting in and out of your clothes and bag. Also the lights are dimmed in the hotel at night, my friend had to go to the bathroom and none of us would go with her. So it was a little scary although totally safe walking around in the dark to go to the bathroom. I had to go early in the morning and decided to just wait till breakfast. Once inside the first bag we all felt pretty good about the process but zippering up both bags and having them lined up correctly proved a little difficult once the cold started setting in. Once we were all securely zipped up it was quite warm. I had to sleep with the bag over my face though as there is no other protection for your head and face. A hat definitely is not enough to keep the cold at bay. We actually slept until the hotel staff woke us up in the morning-we survived no frostbite or frozen body parts! The breakfast was laid out in the lounge by the time we woke up around 7:30am. Our night in the SnowCastle was an unforgettable experience. I don’t particularly like cold weather but with careful planning and the right clothing, the amazing experience certainly outweighed the cold. Visitors can visit just the castle during the hours of 10am-7pm daily. An entrance ticket just for the day is 8 Euro / adult, and children from 4 – 11 years 4 Eur. A hotel room can be booked from 27th of January to 6th of April. Price for a double room is 115-175 Euros per person depending on the day of the week. The price includes breakfast in the lounge and the room. I highly suggest using Nordic Visitor though, they arranged an amazing tour that was totally organized which included a dogsledding excursion, overnight in the SnowCastle, a trip on The Sampo Arctic Icebreaker, a visit to a Reindeer farm, snowmobiling for the entire trip including a night ride to the Finnish forest to see the Northern Lights, and various snacks. How to Get to Kemi, Finland? Even booking this trip through Nordic Visitor or a similar company, you will be responsible for booking your own flights. The nearest and only airport is Kemi-Tornio, flights can be arranged through Flybe from Helsinki, Finland. 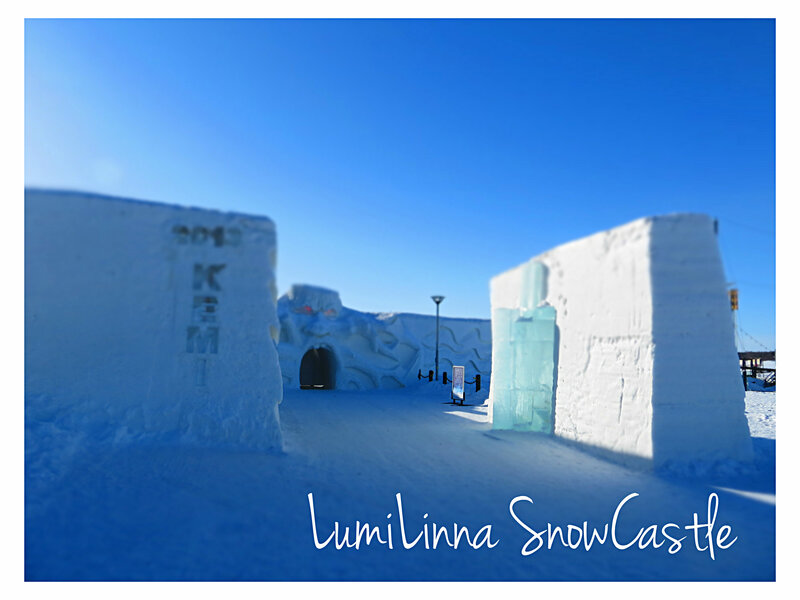 Before booking your package to the SnowCastle check the flights from Helsinki as there are limited travel times. 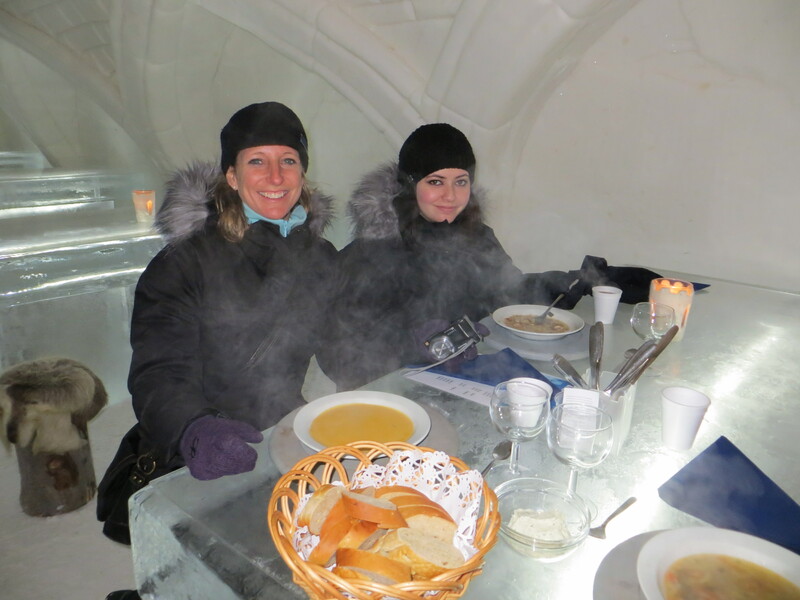 This entry was posted in Arctic, Uncategorized and tagged Arctic Circle, Finland, Finlandia, Gulf of Bothnia, Ice hotel, Icebar, icehotels, Kemi, travel. Bookmark the permalink. ← Vacationing in the Nordic Countries! I am now not sure whether this put up is written by means of him as nobody else recognize such exact approximately my trouble.